We decided to go ahead with our visit to the Cotswolds despite the beast from the east heading our way. The weather was sunny and looked like a glorious spring day but bitterly cold. 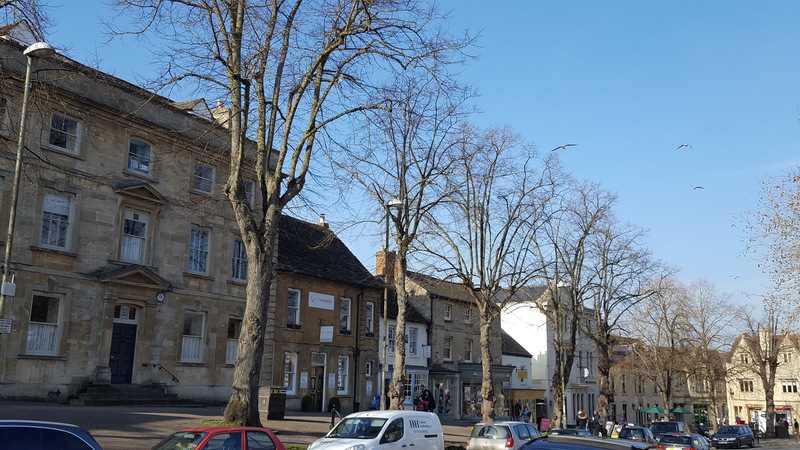 As it wasn’t grey and pouring with rain and not snowing until the following week that would be OK.
We stopped at a pretty town called Witney on the way to the Cotswolds area and enjoyed a wander around the town. Popped into a coffee shop for some quick refreshment and were duly sent upstairs because they were so busy. Amazing how coffee shops are always busy and you have to fight to find a space to sit. Anyway, we found a table and sat and admired the view of the old radio, church and common. In fact, it was so pretty, I decided to take some photos much to the fascination of the other customers. 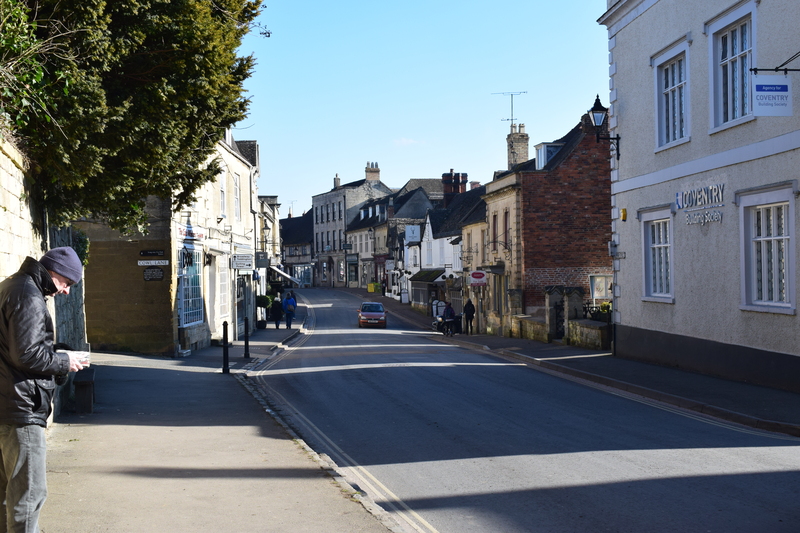 Next stop was Burford, which is basically a town on a hill with far reaching views of the countryside. 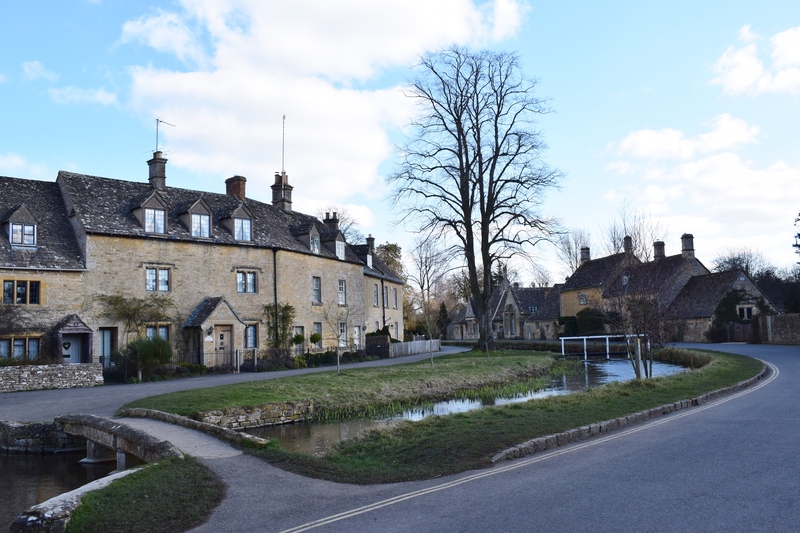 This place is the ‘gateway to the Cotswolds’ and a popular medieval wool town. Lots of stone walled buildings which are said to retain the original medieval street plan and some houses bear traces of the Middle Ages. The road runs east-west, originally past the 16th century market hall called the Tolsey which is now a local history museum. We strolled down the hill observing the views and when we came to the bottom of the hill there was a pretty stream and a house with dogs watching us through the window. We stayed in a wonderful B & B guest house in Cheltenham that night, which was simply stunning. A beautiful, immaculate French colonial style villa built in 1855, called The Battledown. 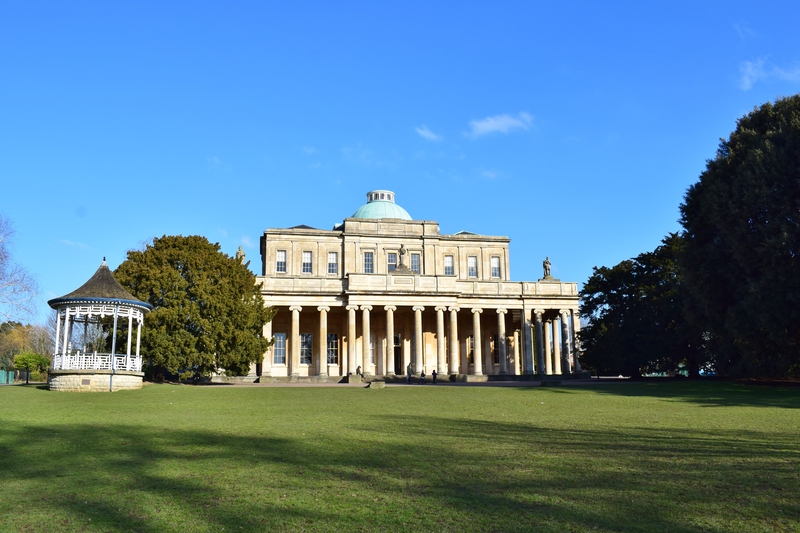 It is conveniently located on the east side of Cheltenham and about a mile from the main town. When we arrived, we were given a warm welcome and offered a cup of tea. So I admired the décor of the immaculate dining room and enjoyed a cuppa with homemade cookies. The owner gave us a map and information about Cheltenham and the Cotswolds and even told us about the local pub, the Sandford Park Ale House. Wonderful service and attention to detail. We were then shown our room (where our bags had already been delivered) and left to unpack. We then walked into Cheltenham to explore the town. 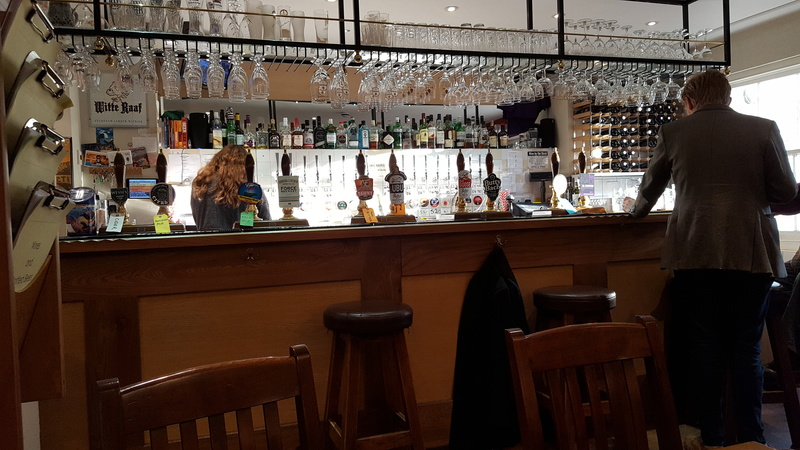 Was expecting something more grand to be honest, but we did enjoy a small libation in the Sandford Park Ale House, which was rather splendid and had a superb selection of ales and craft beers. I enjoyed a small Mad Goose Pale Ale, which was rather delicious. After a superb full English breakfast the following morning, with homemade baked beans, marmalade and banana bread we set off to explore the Cotswolds. First stop, was a quick look at the Pittville Pump Room, which is basically a wedding venue but interesting to view nonetheless. Majestic columns, ornate interior, impressive domed ceiling and set in extensive lawns. Pleasant enough to have a quick nose around and also had a quick look inside, but scurried off when we heard the echoing footsteps. 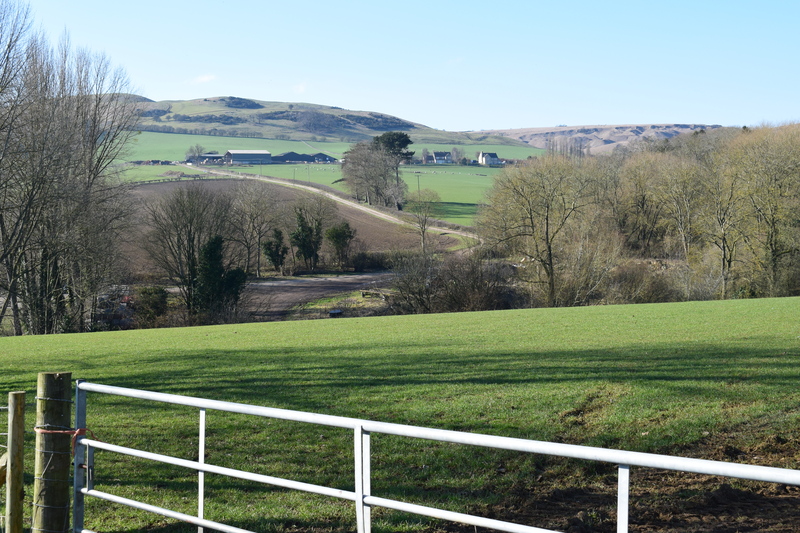 On the way to our first stop Winchcombe, we paused to admire the countryside of Cleeve Hill. This is an area of outstanding beauty and it shows. Also known as the Cleeve Cloud, it is the highest point of the Cotswolds hill range at 1083 feet. The whole area commands some of the most breathtaking sights. 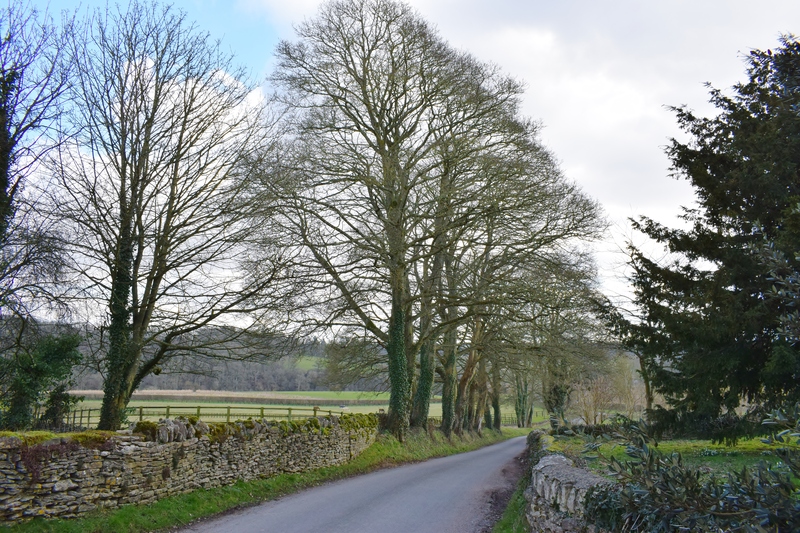 Well worth taking some time to admire the local countryside and probably, like the rest of the Cotswolds, a great place for some exacting walks. Winchcombe was our first stop and very quiet. I feared everything would be shut, but as we sauntered through the town, many places were open and the town soon came alive. 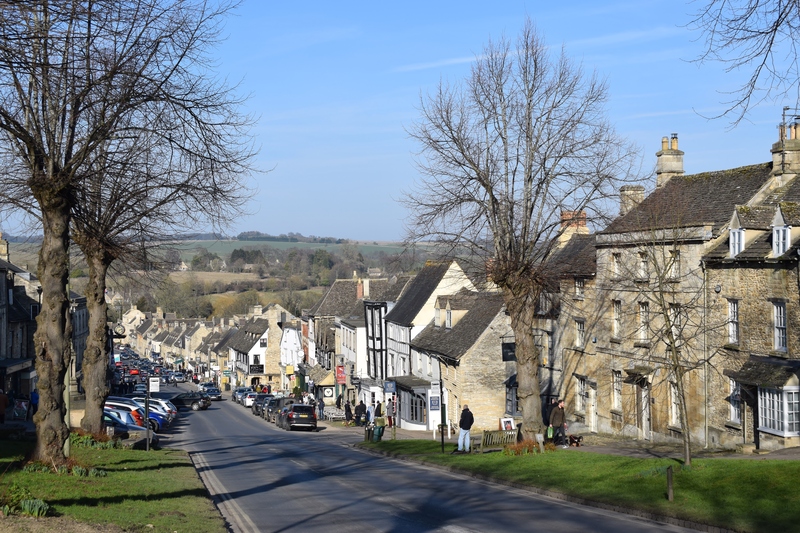 Winchcombe is a pretty ancient Anglo Saxon village with the nearby Sudeley Castle. 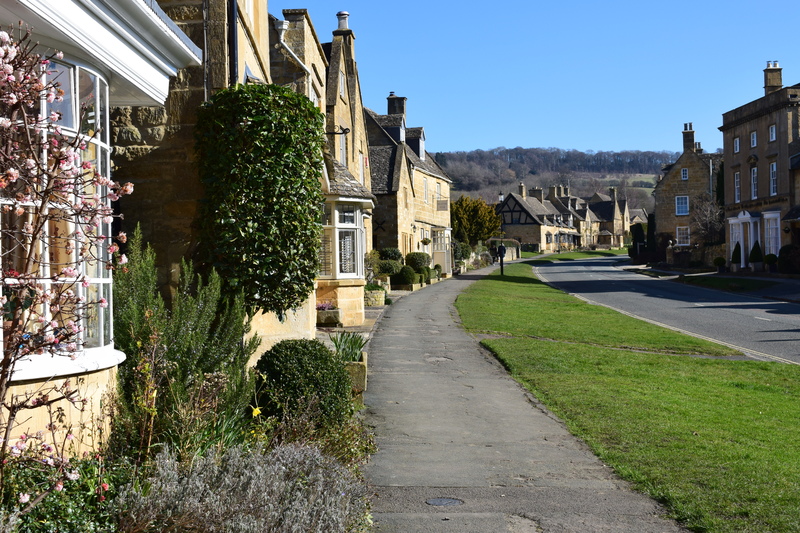 Apparently, Winchcombe means ‘valley with a bend’ and the town still has the street which does a curve along the ‘combe’. The area was known for tobacco growing which was banned in 1619 due to the interest of industry in America and the colonies. 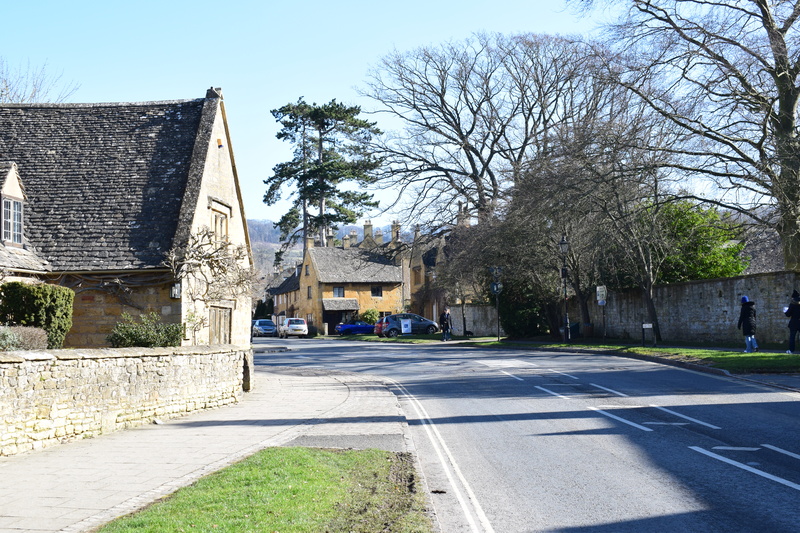 Next stop was Broadway and Chipping Campden. Broadway is a little different because of the broad road area. However, it is just as picturesque with an interesting heritage and was an ancient ‘ridgeway’ and the main road from Worcester to London. 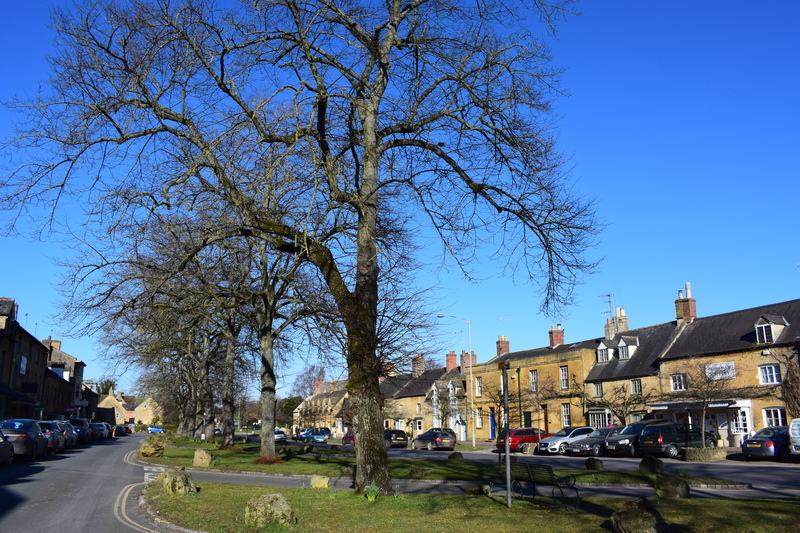 The high street is lined with horse chestnut trees and has a fascinating mix of period houses with the honey coloured stone cottages that are so prevalent and world famous in the Cotswolds. We enjoyed seeing some early spring flowers and blossom too. Don’t be fooled by the sunshine, it was very cold, but little did we know how cold it was going to become! Onwards to Chipping Campden, where we enjoyed a memorable chocolate cake. I say cake, it was like a thick biscuit with chunks of chocolate and it was amazingly delicious. The sedate ambience was lovely and the residents are said to be fiercely protective of the woollen boom. The place is delightful and well preserved with a magnificent 15 century church and market hall built in 1627 as a centrepiece for the town. Later during the afternoon, we had a brief stop at Moreton in Marsh. My husband used to visit there as a child because his parents travelled to the town to visit friends. 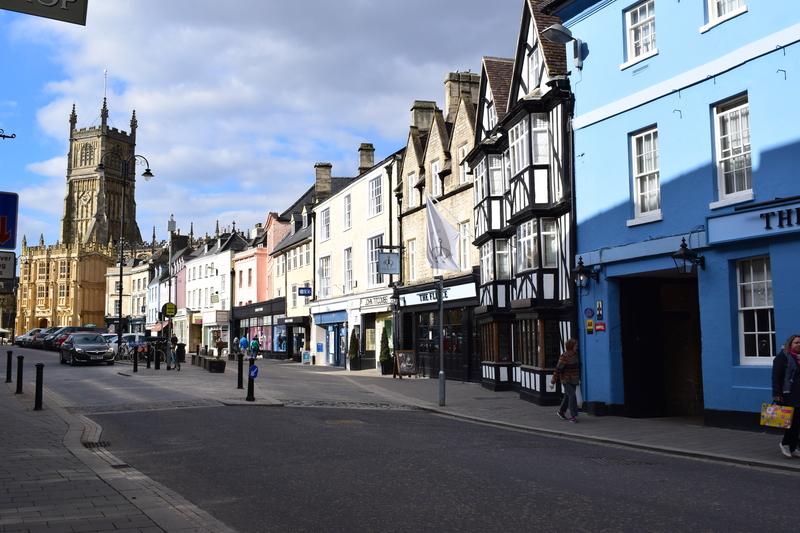 It is a pleasant town and historically known for its coaching station before the Oxford to Worcester railway in 1853. There is an array of pubs, inns, hotels, tea shops and an elegant eighteenth-century feel to the place. 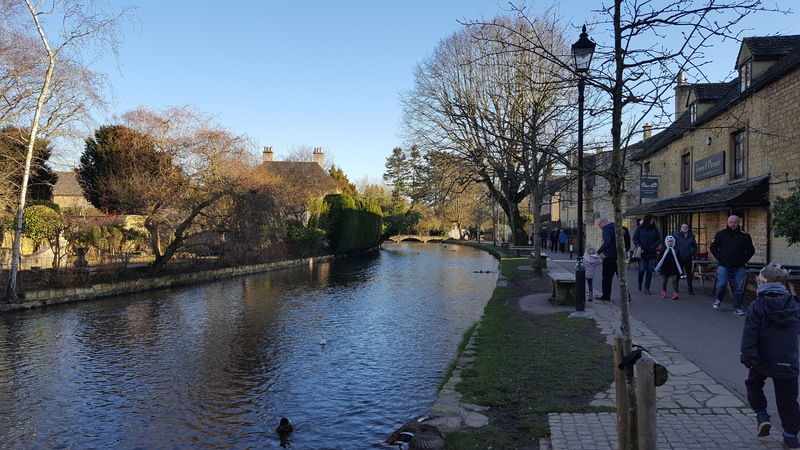 Finally, we went on to Bourton on the Water where we had booked a B & B for the night. We stayed in a great B & B guest house, the Broadlands Guest House, and welcomed by a friendly owner. The breakfast was again, splendid with very generous portions. Great value for money too. 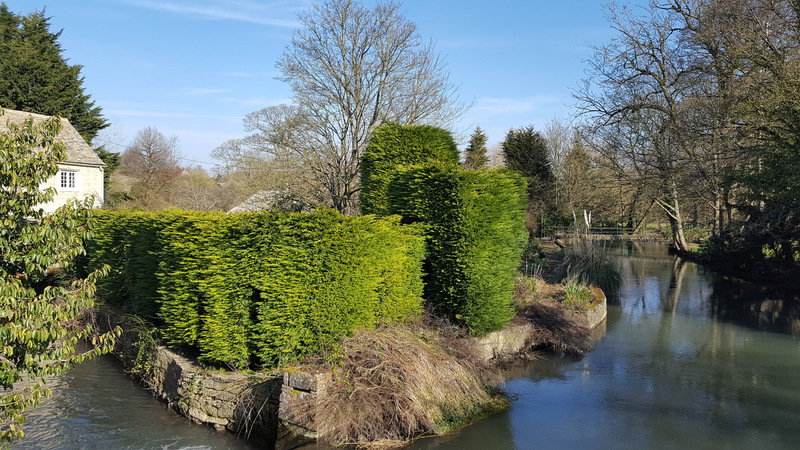 The tranquil river is fed by springs and meanders through the village which epitomises a rural England. Quaint shops, the Old Mill and the arched stone bridges are so relaxing and attractive. 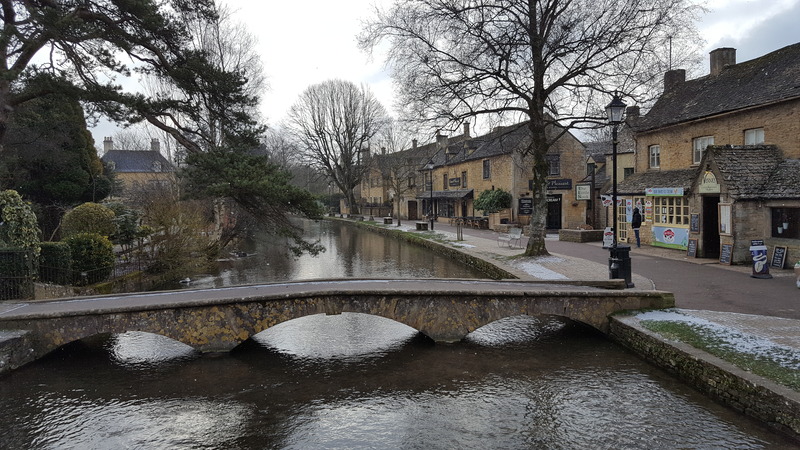 The earliest bridge is said to have been built 1654 (known as Broad Bridge) and that is what is so charming about the Cotswolds; it is old and has preserved its beauty. If you go to the Cotswolds, do not miss this place as it is, in my opinion, the jewel in the crown. One thing though, make sure you frequent the pub just outside of the village centre called The Mousetrap Inn. It is the pub to relax and eat in. 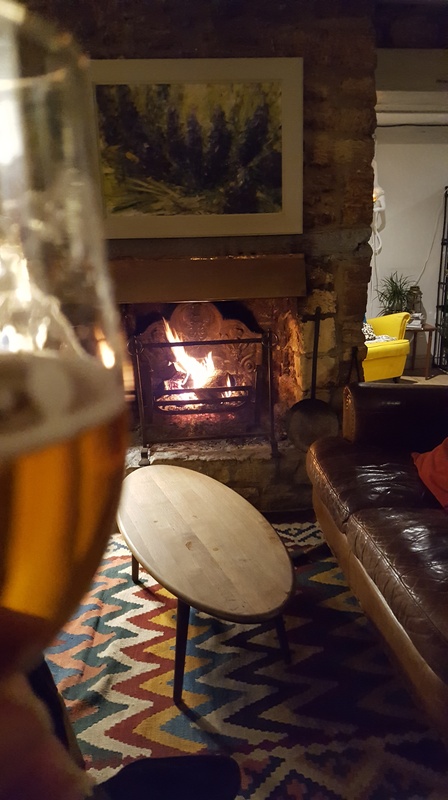 You will enjoy a well stocked bar offering ales, lagers and ciders and has been included in the CAMRA ‘Good Beer Guide’ over several years. We enjoyed a scrumptious roast lamb and chocolate brownie. The place was busy even on a fiercely cold Monday evening so is probably heaving with people, in the summer. So for a last full day we visited Lower Slaughter and Upper Slaughter. The cold weather was really taking the Micky out of the glorious sunshine now, as temperatures plummeted to –2c. Most of my photography shows warm, sunny spring days, but in reality, it was so cold on this day, we could barely stay out of the car for too long! Lower Slaughter is tiny and very picturesque, although there is not a lot there the countryside and mill views are joyful and I felt this is where my photography really captured the Cotswolds. The Old Mill which was last used commercially in 1958, and the shop full of curious and unusual gifts. This place was voted Most Romantic Street in Britain (2011) and this title is probably well deserved. I wonder how many men have proposed marriage here? The name comes from the Old English name of a wetland ‘slough’ or ‘slothre’ which is Old English for muddy place. 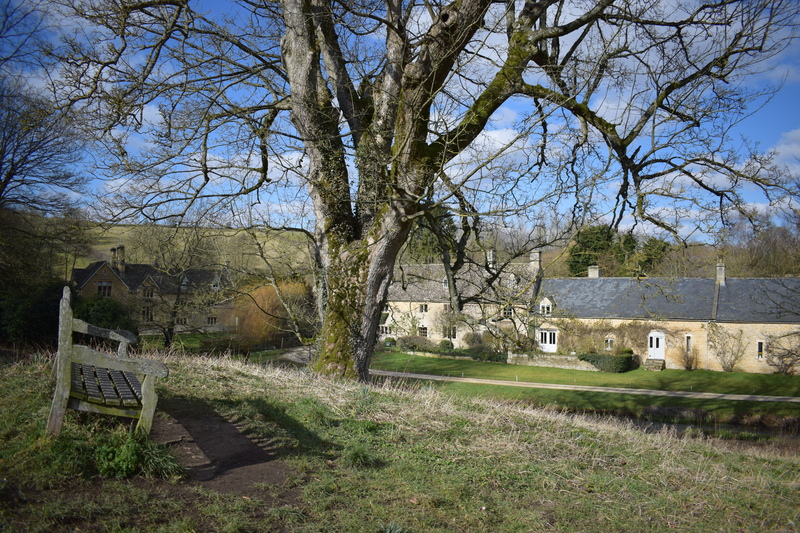 Upper Slaughter is another super place for photography and wandering aimlessly. The village is known as a Double Thankful Village because all of their members of the armed forces survived both World War I and World War II. Onwards, to Yanworth where I enjoyed some landscape photography while hubby waited patiently in the car. Can’t tell you how cold the weather was. Oh, I already have haha! Not been so cold for years and years and even wore tights under trousers! Haven’t done that since I was a young girl. On the way home, we stopped at Cirencester which was so cold (minus 2c) and with the wind factor felt like minus 10c. We had a quick look around and enjoyed a teacake and cuppa and set off home knowing we were facing several inches of snow in Kent. We got home OK, although they shut the A21 due to a serious accident so we did a risky cross country tour and arrived home to a freezing house because the heating had inadvertently turned off. Hopefully, it will be sunny but not quite as cold. Thank you for reading this rather long epistle on the Cotswolds. A truly wonderful, outstanding area of natural beauty. 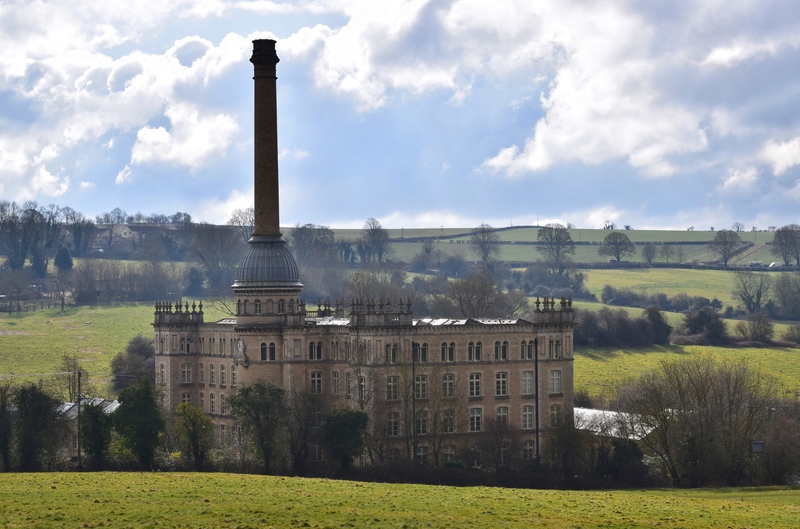 On the way home, we visited Chipping Norton and saw this amazing building which fascinated us so much we stopped the car and went for a walk towards it so I could take some photos. I’ve since discovered it is called Bliss Tweed Mill, which manufactured tweed and became a listed building around 1980 (Grade II). The Mill was built in 1872 for cloth manufacturer William Bliss and designed by George Woodhouse of Bolton. The chimney stack is styled as a tall Tuscan column and supported by cast iron columns. The mill prospered in the First World War after a large order for khaki cloth for the British Army, was received. The mill closed in 1980 and was converted to residential apartments during the end of the ‘80s. ← Films, Gravesend, Community Pub and Snow! Hi Andrea, thanks for posting, and for sharing your photos of this lovely area. I have some fond memories of a camping and cycling holiday in the Cotswolds, back in the early 1980’s. I was 30 years younger then, and a lot fitter, so the cycling wasn’t a problem, although there were still a few hills where I had to get off and push! 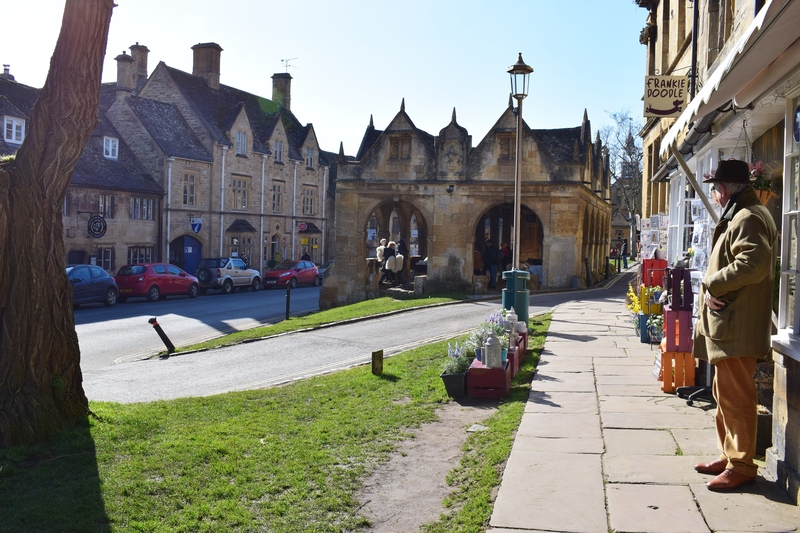 We started our holiday in Burford, and yes it really did seem like the “Gateway to the Cotswolds”. We only stopped for a drink though, at a pub somewhere down the hill on the right, before continuing on to Stow-on-the-Wold. We found a campsite nearby, and spent the next few days exploring the local area. Being very much into “real ale” even back then, we visited a quite a few pubs belonging to the local Donnington Brewery. 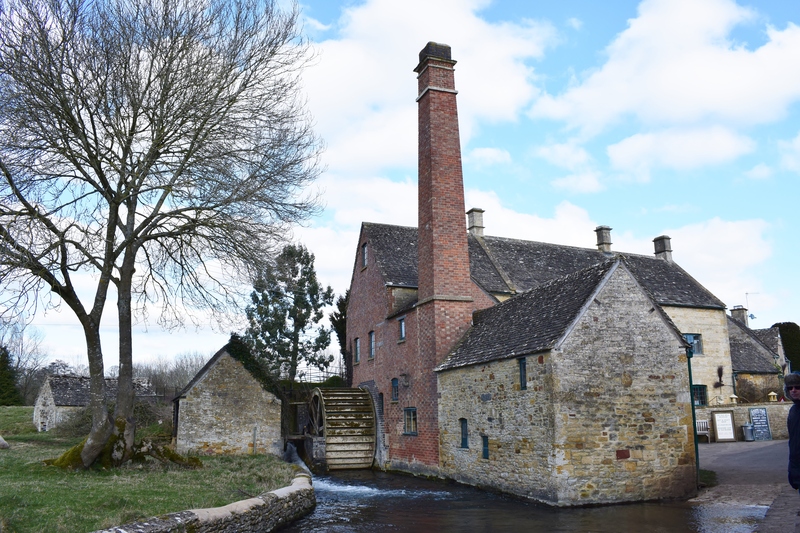 We also cycled out to Hook Norton – again to sample the local Hook Norton ales at source, stopping off at Chipping Camden on the way. Later on in the week, we moved to Broadway, where there was a larger campsite, with better facilities. 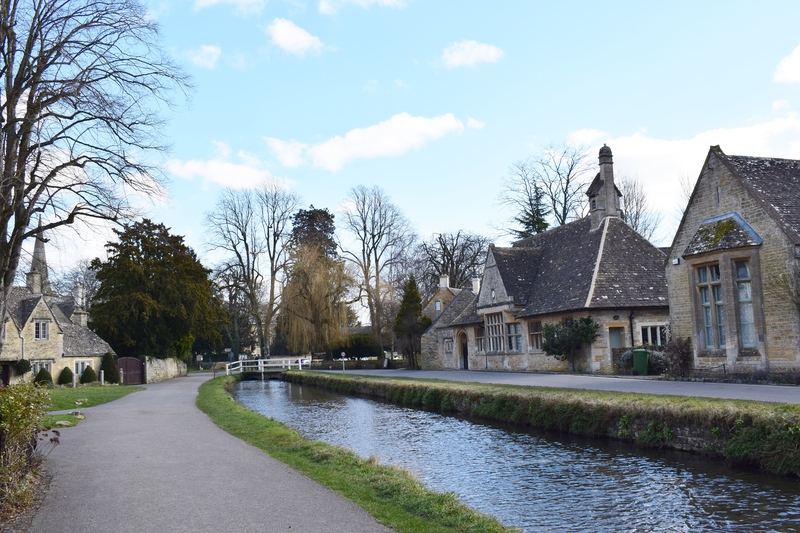 We of course, visited Bourton on the Water, but being early summer it was a little over-run with tourists. It’s still a lovely place though, and I would love to go back. What a beautiful, and interesting area. The Pub was interesting. I wish I could visit one just once. Thanks for the great pictures, and information. Lovely to see all of the places, we have been to most of them, as we have stayed in our touring caravan just near Bourton on the Water and I love., it we live in Northamptonshire so not so far away.